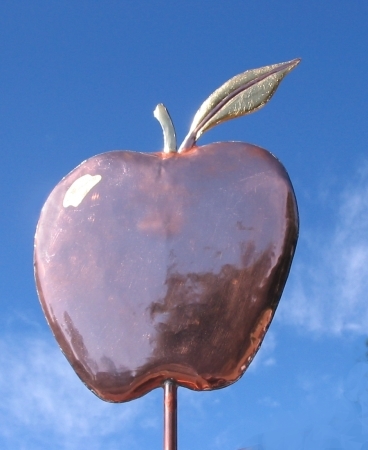 Our Apple and Orchard Ladder Weathervane was commissioned by an owner of apple orchards. He knew how great it would look mounted atop his historic wooden barn. This client also requested optional gold leaf to illustrate the shine of the apple and add distinction to the leaf. Gilding is a lovely way to add brilliance and contrast to a copper piece. As the metal weathers through the browns, and eventually patinas into the greens the gold leaf will maintain its brightness for many years. 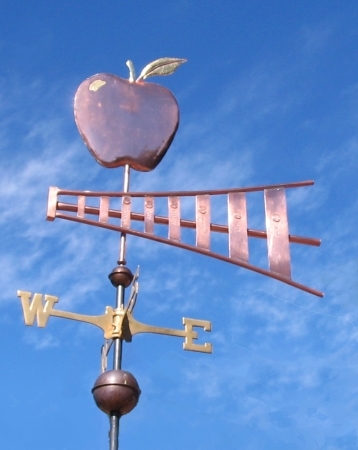 This weather vane has several ways it can be personalized. 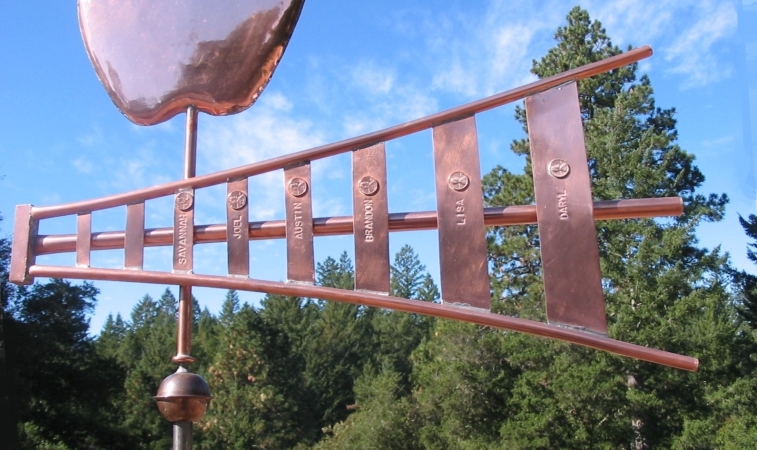 If you look at the detail of the ladder, you will see on each rung we have stamped the name of a family member and next to each name, we attached a ‘Lucky Penny‘ from their year of birth. The tradition of adding a penny to a weathervane from the year of fabrication dates back to the Victorian Age. We have expanded on that idea to create the West Coast Weather Vanes tradition of also including pennies of significant dates in the lives of the purchasers. Both the inscriptions and the ‘lucky pennies’ are included in the price of this weathervane. All of our weathervanes are custom crafted to order. We enjoy personalizing every piece. 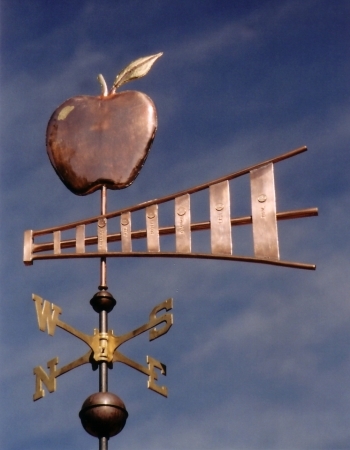 This weathervane would take well to having a business name gilded on the apple’s surface, carrying on the historical use of vanes as signage, to assist customers in finding your location.